Genre: YA, YouTube, Wonderings, Autobiography, Self Help. Summery : We all know that growing up is hard to do, and sometimes the only thing that makes it better are the reassuring words of someone who has walked that bumpy road just a few steps ahead of you and somehow ended up as a fully-functioning adult. Carrie Hope Fletcher is that person. Thanks to her phenomenally popular YouTube videos, Carrie has become an ‘honorary big sister’ to hundreds of thousands of young people who turn to her for advice, friendship and, most of all, the knowledge that things will get better. However, having following Carrie’s work for quite some time before this release I didn’t know what to expect when I learned that the book I was anticipating wasn’t fiction. I’d always assumed that anything Carrie wrote would be fiction and her mind would come up with these fantastically amazing characters. All I Know Now still didn’t disappoint me even though it was not what I expected. 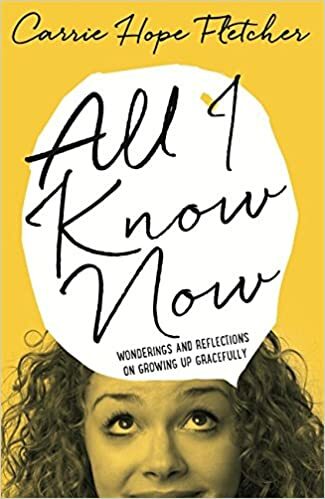 It takes you through her journey of growing up, what she has learned and not learned, what embarrassing stories she had to tell and quite frankly, some traumatic things she shouldn’t have kept quiet about. All this along with sparking the memories from your own teenage years. There’s something amazing about reading someone’s work and being able to relate that back to your own life and past. Carrie’s book is aimed at Young Adult readers I would say. It’s about surviving your teen years and getting through those tough hormonal times. I read All I Know Now as a twenty year old woman (big kid) and although I felt a little out of place reading it, I definitely enjoyed it all the same. While reading, I knew that it wasn’t really aimed at me, but I do think that for a teenager or young adult this book would be extremely useful. I for one would have loved something like this when I was 15 so that I knew I wasn’t completely on my own with my embarrassing moments! The book is divided in to acts and then in to chapters. These chapters are each about a useful life tip such as ‘how to bite your tongue’ or ‘the idea of falling in love.’ Carrie writes about things that she’s experienced and things that she thinks others might benefit from. It’s cleverly set out and easy to read and it made it very enjoyable. Carrie is due to release a fiction book ‘On The Other Side’ next summer and I cannot wait to see what her mind has come up with for some brand new characters! However for now, reading about her experiences with growing up made me happy to think about my own teenage mistakes!